Amongst the intertidal rocky shore crustaceans we find crabs, shrimps and barnacles. 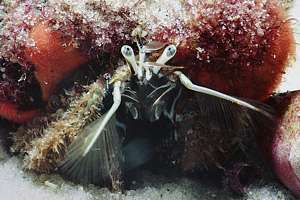 The shrimps like to live in the water, some crabs can live out of the water and barnacles can live out of the water for long periods of time. Because of this, barnacles are amongst the most prolific creatures on the intertidal rocky shore. Don't forget to visit the main chapter of the rocky shore. 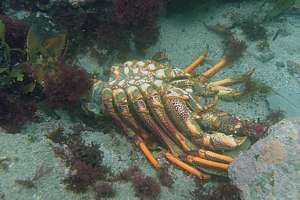 Crustaceans belong to the Arthropods who have external skeletons and jointed legs. The Arthropods include ants, bees, spiders, scorpions but also many marine creatures like shrimps, lobsters, crayfish, barnacles, sea lice and many more. Unlike land Arthropods, crustaceans have gills and two pairs of antennae. Because crustaceans live inside a box (their external skeleton), they are unable to grow unless they escape from the box first. This they do by moulting. The box is split between chest and tail and the animal extracts itself from its feelers, eyes, legs, gills and tail. A cast moult looks every bit like the original animal. These have five pairs of legs and two pairs of feelers. Underneath their tails they have another five pairs of swimming legs or swimmerettes. Females use these to hold their eggs with. f013929: the common shrimp (Palaemon affinis) or rockpool shrimp [tarawera] is a most amazing native species as it swims gracefully forward and backward using its pleopods (swimmerettes). 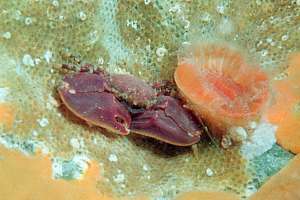 Females hold their eggs between these swimming legs. This shrimp has 4 little nippers and 4 long antennas that give it advance warning of any attack. 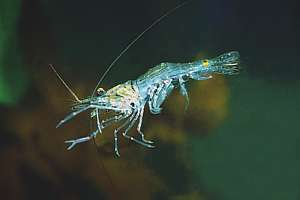 Although the common shrimp is found in rock pools, it is much more common in sheltered estuarine creeks. 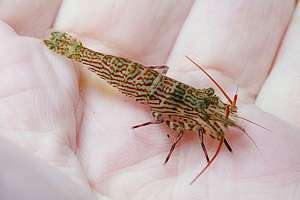 f050433: the painted prawn (Alope spinifrons) does not swim around but crawls in between quick backward bursts of speed. The patterns on its body seem dull brown but they consist of bright blue and red colours. 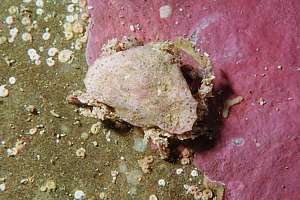 It usually lives in small groups underneath boulders. 0609164: small snapping shrimps, perhaps Alpheus novaezealandiae, [kowhitiwhiti moana] a native species. 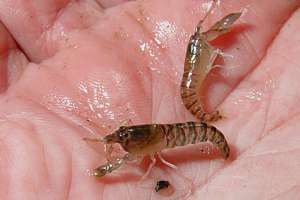 Snapping shrimps have one big claw with which they make loud snapping sounds. f003505: although the red rocklobster (Jasus edwardsii) [koura moana] or crayfish is seldom found in the intertidal, its external skeleton or moult is often washed up into a rockpool. 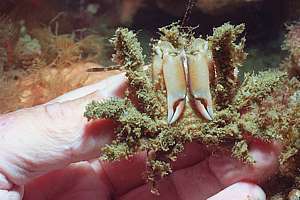 The crayfish shown here is 'empty' as the animal has left its moult to grow a bigger one. Inbetween the foliage of seaweeds lives a well camouflaged small weed prawn (Hippolyte bifidirostris) with tiny blue specks (35mm), and the larger chameleon prawn (Hippolyte multicolorata) (60mm) which changes colour at will or according to what it eats. The infra order Valvifera consists of millipede looking crustaceans with ten body plates and 8 pairs of legs. Idotea stricta: a tubular shaped 'stick insect' or sea centipede [weri moana], brown to green in colour often found on brown seaweeds. 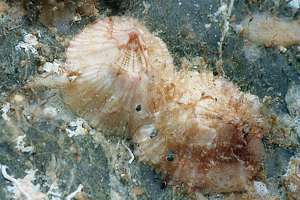 Barnacles begin their lives as a shrimp-like creature which settles down in a suitable place. It then cements its head to the rock and begins catching prey and cementing a huge limestone skeleton of four or six plates. Miraculously it is able to grow this house bigger and bigger. 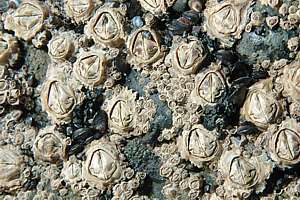 Barnacles close their houses with a hatch consisting of two or four plates. 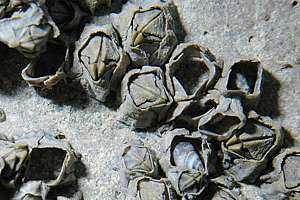 The four intertidal barnacle species: 1. column barnacle Chamaesipho columna, 2. brown barnacle Chamaesipho brunnea, 3. modest or sheet or beaked barnacle Austrominius modestus, was (Elminius modestus), 4. plicate barnacle Epopella plicata (Elminius plicatus). The brown barnacle lives highest up the shore, followed by the columnar barnacle, plicate barnacles and sheet (modest) barnacles. A barnacle is a crustacean, living upside down in a house of 4 or 6 plates in such a way that it can grow these plates bigger. Instead of having legs for walking, its legs have adapted to catching plankton, as they are studded with bristles. It has long catching legs and shorter ones to sweep these clean. 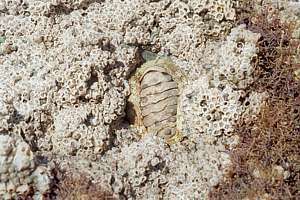 The Chamaesipho barnacles have 6 column plates whereas the Elimius barnacles have 4. Below the intertidal more kinds of barnacle ar found, including the large Balanus species. f009514: the sheet barnacle, beaked barnacle or modest barnacle (Elminius modestus) (Austrominius modestus) [tio piripiri] can cover the rock in a dense sheet of adjoining individuals, no larger than 5mm. Here the sheet of barnacles has almost encapsulated a snakeskin chiton. 0608217: the brown surf barnacle (Chamaesipho brunnea) is usually found intermixed with the sheet barnacle in loose formations. Its lid consists of four parts, separated by one straight line and a wobbly one, as if it is smiling. the sides of the column widen towards where it is attached. 0612059: closeup of the sheet barnacle Elminius/Austrominius modestus, also called the beaked barnacle. Short with a wide base. 0612060: closeup of the sheet barnacle Elminius modestus. The four plates of its column can now be seen. Also blue-banded periwinkles sheltering inside. 0608218: in the columnar barnacle (Chamaesipho columna) the lid is seated deeper inside the column, while its sides do not widen much towards its base. Also the 'smily' line is less pronounced than in the brown barnacle, and is simpler while also more erratic in shape. Columnar barnacles often fuse tightly together. 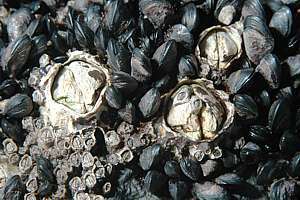 In this photo the columnar barnacles are surrounded by flea mussels and sheet barnacles. f009622: the plicate barnacle (Epopella plicata) likes more shelter than the previous barnacles. It has a folded (plicated) column with four outer plates and is very sharp on top. Coastal NZ, not found on outer islands. 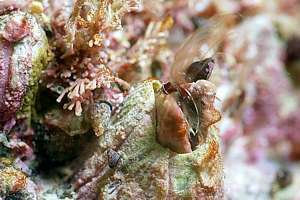 the large pink barnacle (Balanus decorus) [tiotio] (40mm tall) has alternate pink and white plates. It lives in deeper water and is widely spread. f048927: the flat barnacle (Tetraclitella purpurascens) is found only submerged. It tapers widely towards its base and its opening is very small and triangular; its trapdoor is similarly shaped. This barnacle can indeed be very flat at times. f048932: this conical submerged barnacle (Aaptolasma nolearia?) has its hairy legs out, catching plankton. The fan of legs moves like a hand, clutching imaginary particles, then withdrawing the hand momentarily. Where the current is fierce, the hairy hand is just stretched out and pulled in again. 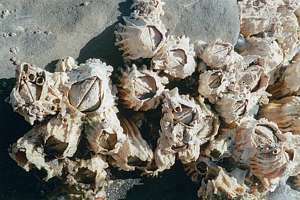 Goose barnacles [werewere] are occasionally found on the rocky shore. They prefer to live submerged. Some are found attached to flotsam. There are many species but all have a flexible stalk and a barnacle-shaped animal on top. Some have long stalks, others short. Some allow themselves to be grown over by other species, becoming unrecognisable in the process. Calantica spinosa [werewere tukaha] is a 40mm gooseneck barnacle with small embedded spines in its stalk. Calantica villosa isa 40mm gooseneck barnacle with small spindle-shaped scales and plates that may have a felt-like texture. deep-sea stalked barnacle (Smilium zancleanum) [werewere huna] found only in deep water such as on telephony cables. eared stalked barnacle or whale barnacle (Conchoderma auritum) [maungunga ika moana] found on humpack whales. striped stalked barnacle (Conchoderma virgatum) [maungaunga] found only on bottoms of ships and flotsam but sometimes attached to the bodies of fish. 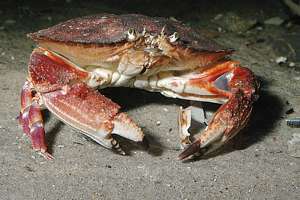 Crabs are crustaceans with flattened bodies and legs adapted for scurrying sideways, sometimes at high speed. 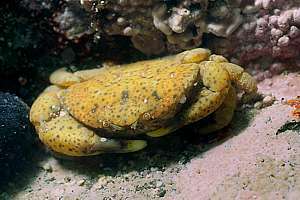 As they grow, they shed their exoskeletons, which can often be found in rock pools. f015513: the moult of a purple shore crab (Leptograpsus variegatus) [papaka nui]. 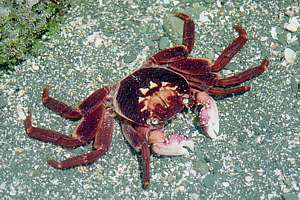 Although formidably strong and fast, the purple shore crab scuttles away often long before being seen. It lives mainly out of the water in rock cracks, foraging at the low tide by night. Its legs are flattened and it has equally sized nippers. f219109: the smooth shore crab (Leptograpsus/Cyclograpsus lavauxi) is found high above high tide, near the land vegetation line. It lives in moist and cool places. Only 2cm wide, this crab looks a polished smooth grey or brown, speckled or marbled, with light coloured nippers. It is shy and difficult to catch. The one shown here lives in a rotten wharf beam. 28mm carapace. f033505: the red rock crab (Plagusia/Gainusia chabrus, P. capense) [papaka ura] lives entirely under water although it may come out to forage on seaweeds that are out of the water. Its skin is covered in fine hairs. It is mainly a plant eater but also scavenges. f050408: a young red rock crab is brown. These animals grow very fast, to adult size within one year. f032507: the blackfinger crab (Ozius truncatus) is quite formidable but placid and can easily be handled. 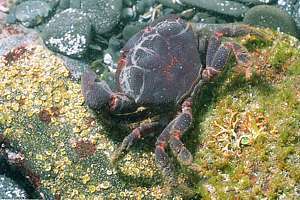 It lives near the high tide level under boulders, but is not found in the South Island. It can grow old often feeding on black neritas. f032427: the bighand crab (Heterozius rotundifrons) or pebble crab, looks very much like a pebble, as it also keeps entirely still when discovered and handled. 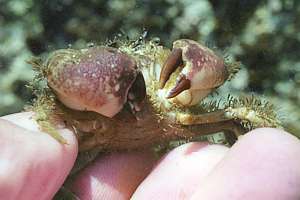 Its right-hand claw is larger and in males very much larger. f033306: a mature male blue pebble crab (Heterozius rotundifrons) found in a mangrove forest. 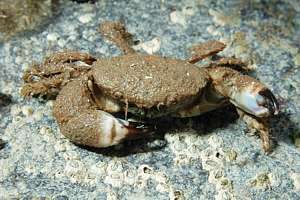 05062222: the pie-crust crab (Metacarcinus novaezelandiae) [ngahorohoro] is active mainly by night. 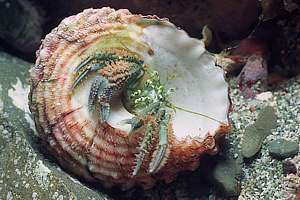 It is a large but docile crab that can easily be handled. 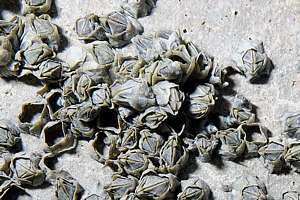 It is found mainly in the South Island. Juveniles appear mottled grey-green. The frontal margin of its carapace is crimped like a pie crust. f050405: the common rock crab or black marbled crab (Hemigrapsus edwardsii) [rerere] normally has a smooth skin, but this one was fouled by algae. Its main colour is purple, with beige patches. 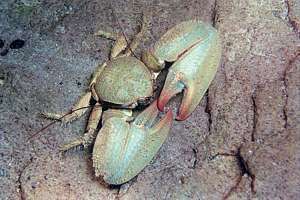 f050407: the same crab as shown on left. f018935: a young female triangle crab (Eurynolambrus australis). 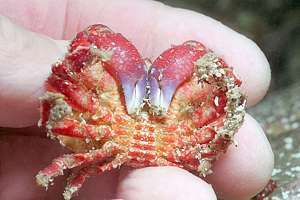 Young crabs are not yet brightly coloured, and females always have small nippers. 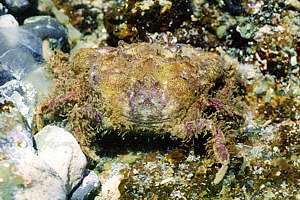 Triangle crabs can live only fully submerged, and they are found underneath boulders. f050520: a male triangle crab has much larger nippers than the female and its tail is much thinner too, as in all crab species. f050518: a mature male triangle crab (Eurynolambrus australis) f018834: the NZ bristle crab (Pilumnus novaezelandiae) [papaka] or hairy crab. Half crabs deserve their name from the fact that they miss a pair of legs. In many a rudimentary pair can be seen. 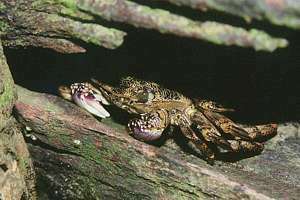 Half crabs have large claws even though the main source of their food is zooplankton and detritus. They catch these fine particles with a pair of mandibles equipped with a fine sieve. By waving these sieves through the water, within the protection of their big nippers, they catch their food. f018605: a mature porcelain crab (Petrolisthes elongatus) [kawekawe] beginning to show its bright porcelain blue colours. These crabs miss one pair of walking legs. They feed by sieving plankton from the water. They can still swim by flapping their tails. 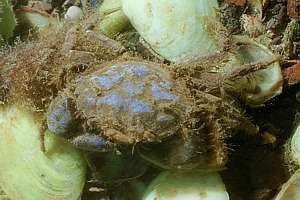 Young porcelain crabs are grey to brown. They can live out of the water for some time. f018919: several species of half crab exist, like this tiny purple one (Petrolisthes novaezelandiae?). 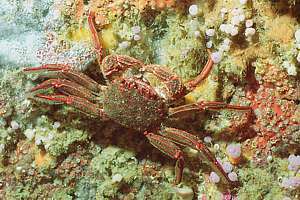 Spider crabs are not flattened like the 'ordinary' crabs, but they have more rounded pear-shaped bodies. Instead of walking sideways, they walk forward. 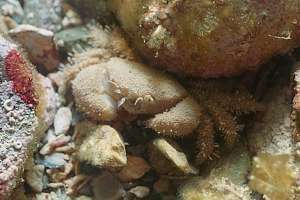 The most common and endeared spider crabs of the rocky shore are the camouflage or decorator crabs or masking crabs. They decorate their backs with snipped-off fragments of local seaweeds, in order to blend in with their environment. 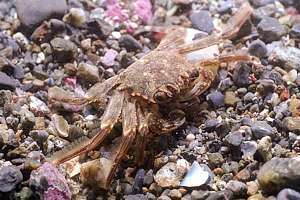 For seaweeds to stay alive, they must see the sunlight, and for this reason camouflage crabs are often found in the open where they can easily be stepped on. f032309: hairy decorator crab (Notomithrax ursus) or hairy seaweed crab is small with fine nippers. It is a precious find and can easily be handled. f032311: frontal view of the hairy seaweed crab shows how well it is camouflaged. 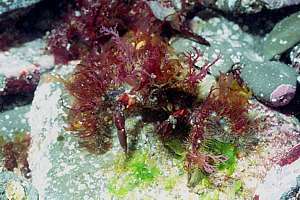 the lesser seaweed crab (Notomithrax minor) is the smallest of the three found in the intertidal. f039232: the Peron's seaweed crab (Notomithrax peroni) [papaka huna] is much larger than the lesser seaweed crab and has much larger nippers too, particularly the males. 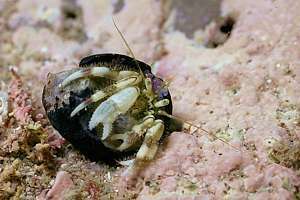 It is much less common in the intertidal zone as it prefers to live in calmer waters. 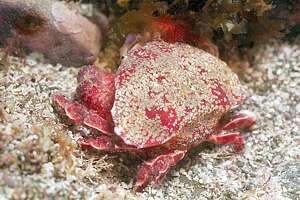 Pillbox crabs are usually found on the sand and mudflats but may also be encountered under stones on the rocky shore. Halicarcinus cookii (13mm) [waerau] has an angular carapace with variable colour from yellow/green to orange and black. Legs are commonly banded and smooth. Halicarcinus varius [waerau] (10mm) has a pear-shaped carapace, its upper half covered in small hairs. Males have hairy nippers. Its colour varies from white/green to yellow. 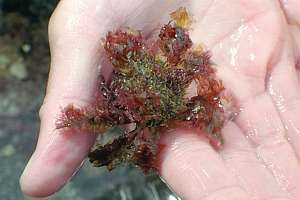 found in sheltered areas on brown seaweeds or under stones. 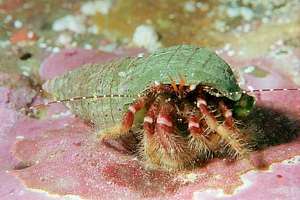 Hermit crabs have coiled tails that are thin-shelled and vulnerable. They have adapted to living inside coiled shells of snails. When they grow they have to leave their shell, shed their moult and find a bigger shell which they plan with care. f050437: a young NZ hermit crab (Pagurus novizelandiae) [papaka moke, kaunga] is almost entirely white. f037015:a mature NZ hermit crab (Pagurus novizelandiae) [papaka moke, kaunga] has blue nippers with rows of tubercles, and smooth antennas. f039509: the plankton hermit (Paguristes setosus) has fine long hairs on its antennas, with which it catches plankton. It does so by waving them left and right, and then 'licking' them with its hairy mandibles. It also feeds from detritus by stirring the sand and catching dislodged particles with its antennas. f018925: orange hermit crab (Diacanthurus spinulimanus?) 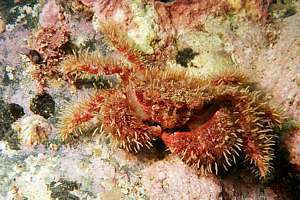 with bristly legs and blocked antennas is usually found in deeper water. It is not very common.